After returning from Portland, I still found myself unwilling to plan anything. The biggest problem, I realize now, was that I had no idea how to set about making a plan. I did, however, know how to write music, and I was aware that I needed to start writing soon. It had been nearly a week since I had left my job and I had yet to write anything. But first I decided to act on an idea I had the night before. I had decided it might be interesting to try making headphones out of salvaged parts. In particular I had decided that the lids from the same type of tin I had used to make my condenser mic might make good earpieces. This idea sounded much better than writing because, to be honest, I was feeling rather uninspired. You know your muse is in the toilet when you find yourself asking things like “why do I write? Why does anyone write? What’s the point of writing? What should I even write about? I ended up going to a thrift store nearby. I did not find what I was looking for, but I did find a 5” lightbulb and a bunch of really cheap Christmas lights. These, I thought, are the answer to my recent dearth of inspiration! 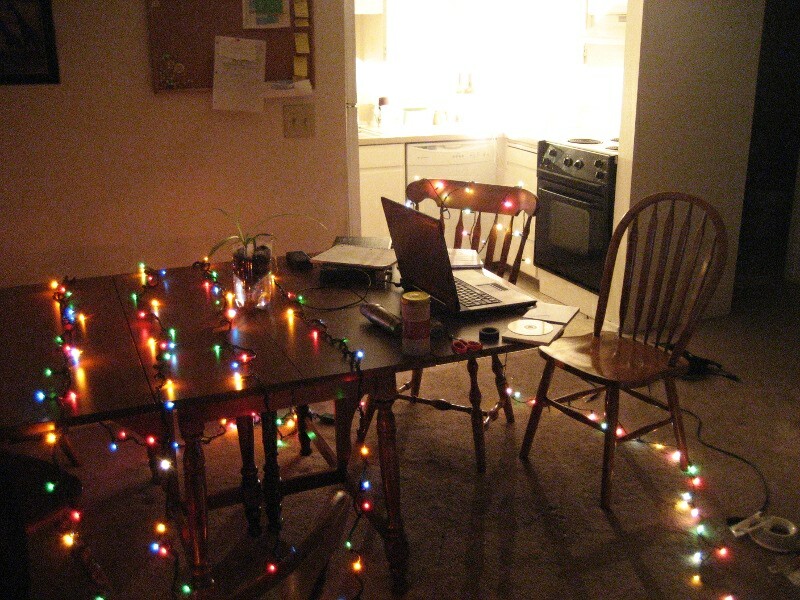 So I came back to my apartment, threw the Christmas lights around, and plugged in the giant lightbulb. Creative space seems to be an important factor in determining what one creates, doesn’t it? I’ve found that I write happier songs on sunny days when I’m able to either open all the windows or go outside, and that the gloomier songs are almost always born at night or in a setting that fits the somber tone. It makes sense since the mental state of a writer is almost always directly reflected in the work they create. It’s impossible to remove this coupling, much as it is impossible to completely remove all traces of oneself from one’s work or to look at something from outside your own point of view. Everything perceived must pass through the window of the mind; it’s nonsense to assert otherwise, for it is the mind itself which perceives. No mind, no perception. In the same way, all your creative work must pass through that same window. No mind, no creation. As writers, as artists, as people who think and create (this encompasses the entire world, for we all think and create) we must pay attention to our surroundings and the effect it has on our emotional health. We must also pay attention to our own ways of thinking, for these can have an even greater effect on our emotions, our actions, even our destiny, than our environment. How many times has a person beaten the deck which has been stacked against them? Ask anyone who has suffered abuse and then gone on to be healthy, happy, and successful, over and against the wishes of their abuser, or who has risen out of poverty. But environment can make success harder or easier to achieve. It is a factor. It does have its effect. This is a lesson I’m finding I have to take more seriously now, for my environment is no longer shared with my coworkers. My creative environment is entirely mine. This is another aspect of the freedom I must get used to. As I’ve said in past posts, it’s exhilarating and yet terrifying. Every aspect of my success is, as of the moment I’m writing this, entirely up to me. So I’ve got my scented candles and I’ve got my lights. I’ve got my Jonsi and my Mika and all other manner of upbeat music. It’s what I need right now, really. It’s the creative space I’ve chosen to create. I like the song. It’ll sound great when it’s more polished. That doesn’t sound like what I mean. It sounds good now, but will sound BETTER when it’s more polished.